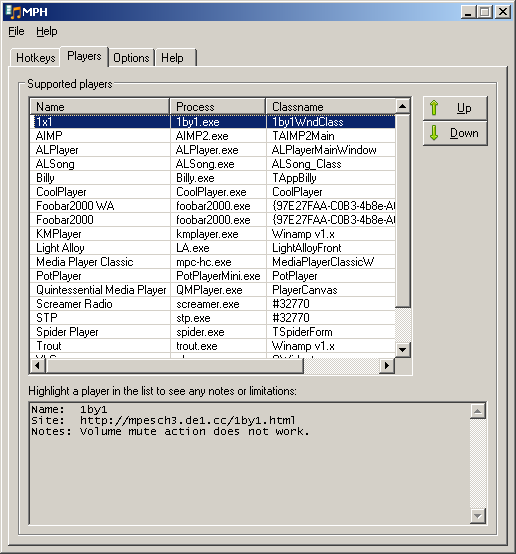 Description: MPH (Media Player Hotkeys) is a hotkey application designed to allow you to control various audio, video and media players from one set of global hotkeys. 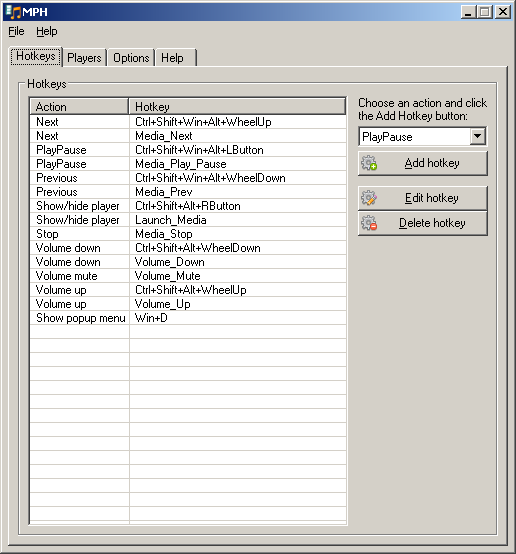 Hotkeyable actions: Play, Pause, PlayPause, Stop, Next, Previous, Volume Up, Volume Down, Volume Mute and Show Popup Menu. You can set however many hotkeys per action as you would like. Extremely flexible hotkey system including mouse buttons and the mouse wheel. Popup menu has configurable icon size: 16, 32, 48, 64 or 128 pixels. 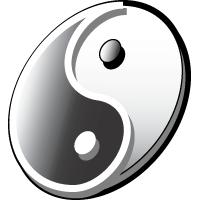 Currently, ~25 applications are fully or partially supported: 1×1, AIMP, AIMP3, AIMP4, ALPlayer, ALSong, Billy, CoolPlayer, Foobar2000 WA, Foobar2000, KMPlayer, Light Alloy, Media Player Classic, Pandora Desktop App, PotPlayer, Quintessential Media Player, Screamer Radio, STP, Spider Player, Spotify, Trout, VLC, Winamp, and Windows Media Player. Installation: Unzip MPH.zip to its own folder and run MPH.exe.